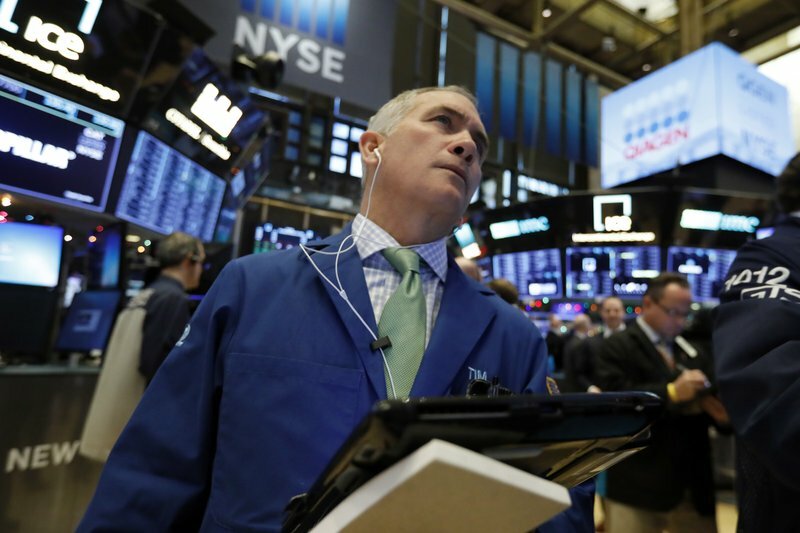 NEW YORK (AP) — Stocks are staggering Friday after weak economic data from China has investors worrying about the global economy again. Mounting tensions in Europe over Britain’s impeding departure from the European Union also darkened traders’ moods. The Dow Jones Industrial Average dropped as much as 549 points. The benchmark S&P 500 index is falling to an eight-month low, with health care companies taking the worst losses. Johnson & Johnson plunged after Reuters reported that the company has known since the 1970s that its talc baby powder sometimes contained carcinogenic asbestos, a claim the company denied. KEEPING SCORE: The S&P 500 index lost 51 points, or 1.9 percent, to 2,599 at 2:45 p.m. Eastern time. It’s on track for its lowest close since April 2. The Dow retreated 515 points, or 2.1 percent, to 24,081. The Nasdaq composite slid 147 points, or 2.1 percent, to 6,923. The Russell 2000 index of smaller-company stocks fell 19 points, or 1.4 percent, to 1,413. December is typically the best month of the year for stocks and Wall Street usually looks forward to a “Santa Claus rally” that adds to the year’s gains. This month, however, the S&P 500 is down 5.8 percent. That followed a small gain in November and a steep 6.9 percent drop in October. J&J PLUNGES: Johnson & Johnson dropped 10.1 percent to $132.90 in very heavy trading, which put the stalwart company on pace for its biggest loss in 16 years. Its market value fell by $37 billion. Other health care companies also fell. Pfizer lost 2.2 percent to $43.60 while biotech drugmaker Amgen gave up 2.8 percent to $166.11. SLOWING GROWTH: China’s government said industrial output and retail sales both slowed in November. That could be another sign that China’s trade dispute with the U.S. and tighter lending conditions are chilling its economy. For more than 20 years, China has been one of the biggest contributors to growth in the global economy, and when investors see signs the Chinese economy is weakening, they expect it will affect other countries like the U.S. that sell things to China. Among technology companies, Apple dipped 2.8 percent to $166.15 and Cisco Systems fell 3.7 percent to $45.71. Adobe skidded 6.7 percent to $231.42 after its fourth-quarter profit disappointed investors and it also forecast lower-than-expected earnings in the current fiscal year. Industrial companies sank as well. Boeing lost 2.5 percent to $317.19. BREXIT TROUBLES: European Union leaders rejected British Prime Minister Theresa May’s request to make changes to their deal covering Britain’s departure from the EU on March 29. British legislators aren’t satisfied with the terms May negotiated, and she canceled a scheduled vote earlier this week because it was clear Parliament wouldn’t approve it. Britain’s economy and financial markets across Europe face severe disruption without an agreement. European bond prices rose and yields fell. Both the British pound and the euro weakened. The pound slipped to $1.2581 from $1.2660 and the euro fell to $1.1305 from $1.1367. ENERGY: Oil prices again turned lower, as a slower global economy would weaken demand for oil and other fuels. Benchmark U.S. crude fell 2.6 percent to $51.20 a barrel in New York. Brent crude, used to price international oils, dropped 1.9 percent to settle at $60.28 a barrel in London. Wholesale gasoline lost 3 percent to $1.43 a gallon. Heating oil fell 1.7 percent to $1.85 a gallon and natural gas dropped 7.2 percent to $3.83 per 1,000 cubic feet. Energy companies also sagged. Exxon Mobil fell 2.3 percent to $75.18 and Schlumberger fell 5.3 percent to $38.86. OVERSEAS: Germany’s DAX declined 0.5 percent and the CAC 40 in France declined 0.8 percent. Britain’s FTSE 100 fell 0.5 percent. PAYING THE COST: Wholesale club company Costco also dropped following its quarter report, as the stock lost 8.6 percent to $207.12. Analysts said Costco’s profit margins weren’t as strong as they expected, and other companies that sell household goods, like Walgreens and Pepsi, also stumbled. METALS: Gold fell 0.5 percent to $1,241.40 an ounce. Silver dipped 1.5 percent to $14.64 an ounce. Copper was little changed at $2.77 a pound. DOLLAR DOWN: The dollar fell to 113.23 yen from 113.60 yen.